These heavy duty chain driven lifts are designed for many years of trouble free service. 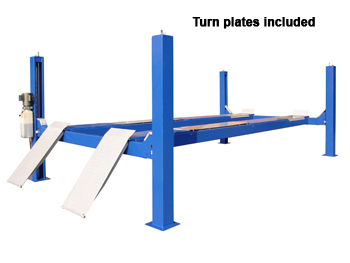 Our four post lifts are constructed with heavy gauge "C" channel. Max Clearance (under track): 60"
Overall Width (Base to Base): 136-3/4"
Max Clearance (under track): 67.5"
No obstructions! 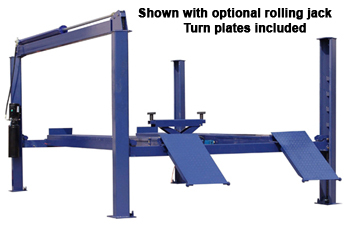 The open front design on our alignment lift allows total access to front wheel adjustment points and with the cylinder located under the track, there's no power beam, eliminating risk of damage to doors and mirrors. Column Height: 92" / 86"
Overall Width (Base to Base): 139"
Max Clearance (under track): 64"